Help your kids succeed in school by creating a homework space that is perfect for reading, writing and arithmetic! From the ideal lighting that helps keep them focused to paint colors that stimulate the mind, let us help set the stage for the perfect homework nook. Short on space? 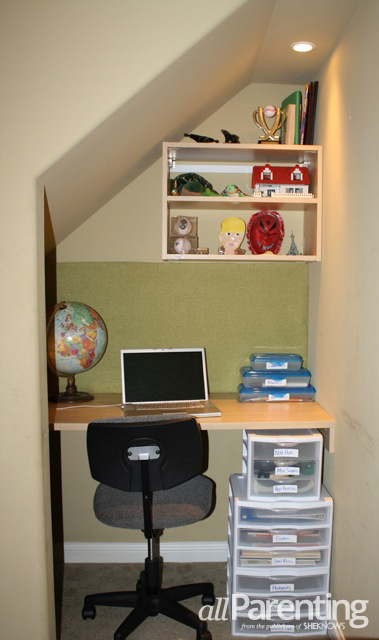 Look for a cozy nook that can be converted to a study spot, as organization expert Monica Friel of Chaos to Order did with her homework station under the staircase. "Make sure the study spot is well lit and comfortable. You want your student to like their spot or they will find another," Friel says. "Cover cork board with fabric and attach it to the wall. Making use of vertical space for reference papers and important notes will be helpful." You can also use their bedroom as a study spot. 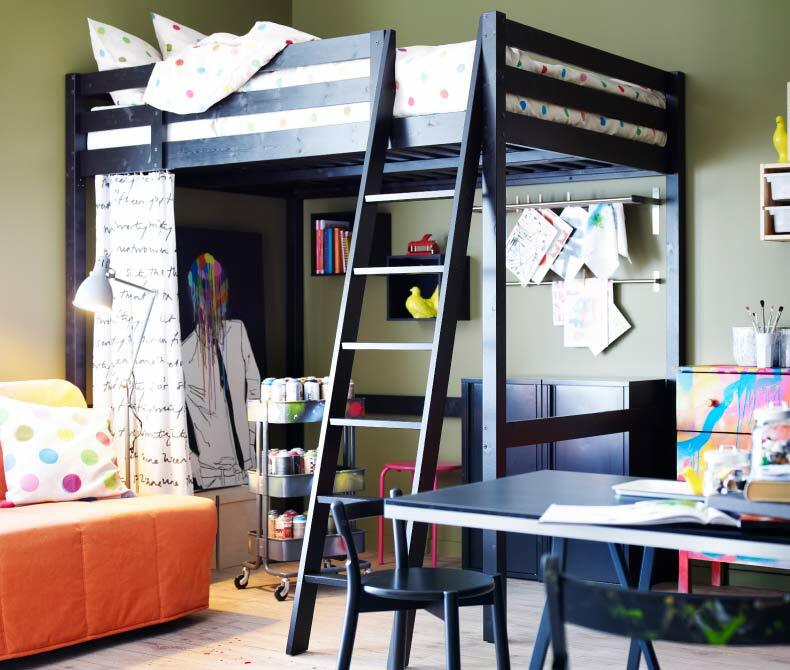 A loft bunk bed frame, such as the pictured Stora from Ikea ($299) is a great choice as you can put a desk underneath. "Products like the Malm desk with the pull-out panel can provide an extra work surface when needed, and be pushed under the desk when not required," Janice Simonsen, IKEA U.S. Design Spokesperson and lead blogger for the Design by IKEA blog, tells us. "One difference with a bedroom is it's important to keep technology at bay for a good night's sleep," she says." Be certain equipment is completely shut off and does not provide residual light that has been proven to interfere with sleep! Whenever possible, separate the work area from the sleep area. A free standing bookcase or wall unit like Expedit can provide a barrier, but even a simple textile screen works well." Simonsen said to look for chairs that are adjustable for height and tilt, such as this cool and colorful Torbjorn swivel chair ($50). "Streamlined, armless chairs work best in a small space, and work well while working on a laptop." "Lighting is crucial to a study space. Mounting a task light on the wall will help save space, but also be sure to provide at least one ambient light in the room to avoid eye strain," she said. 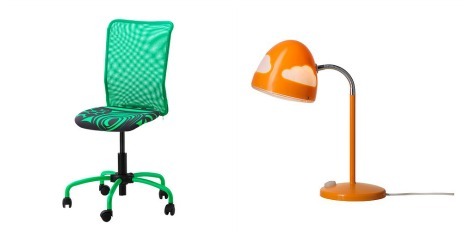 This Skojig work lamp ($25) is a fun choice to add some color to your child's homework spot.